In a boardwise list, Tamil Nadu Board of Higher Secondary Education fared poorly compared to other state boards. Chennai: Even as the school education department has undertaken the syllabus revision, the number of students entering into IITs from the Tamil Nadu state board is poor. Of 8.22 lakh students who cleared the plus-2 exams this year, only 20 students were offered admission in IITs, according to the statistics given by ministry of human resource development. In a reply to the RTI query, it has said this year totally 253 candidates from Tamil Nadu were offered seats at the prestigious engineering institutes. Among them 221 from Central Board of Secondary Education, 19 from Tamil Nadu Board of Higher Secondary Education, 7 from Andhra Pradesh Board of Intermediate Education and 5 from Telangana Board of Intermediate Education and one from National Institute of Open Schooling. This year 49,695 students appeared for JEE (Main) exam from the state and 1,184 qualified the JEE (Advanced) exam. Of which 253 students have got seats in various IITs in the country. Unlike the Neet, Tamil Nadu comparatively performed better than Karnataka (209) and Kerala (181). But still, states like Andhra Pradesh, Rajasthan, Telangana, Maharastra are sending more students to IITs. Tamil Nadu got placed 13th on the list. “Tamil Nadu students also very competent students and there is no doubt about that. But students from states like Andhra Pradesh are devoting more time to prepare for the competitive exams rather than school activities. In Tamil Nadu the culture is different. Everybody prefers to have a proper schooling and after schools, they prepare for competitive exams in their spare time,” said B. Pavan Kumar, deputy director, FIITJEE, Chennai. 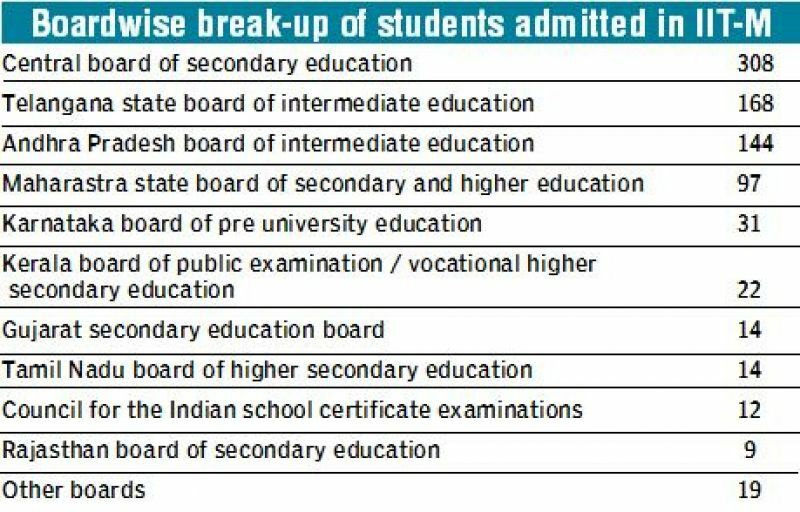 In a boardwise list, Tamil Nadu Board of Higher Secondary Education fared poorly compared to other state boards. Telangana State Board of Intermediate Education has sent highest number of students to IITs with 934 students from the board getting admissions this year. In CBSE board, 5,994 students got admitted to IITs. From Maharastra highest number of students (1.63 lakh) appeared for JEE followed by Uttar Pradesh (1.2 lakh) and Andhra Pradesh (83,088). “The awareness is also more in states like Andhra Pradesh, Rajasthan. 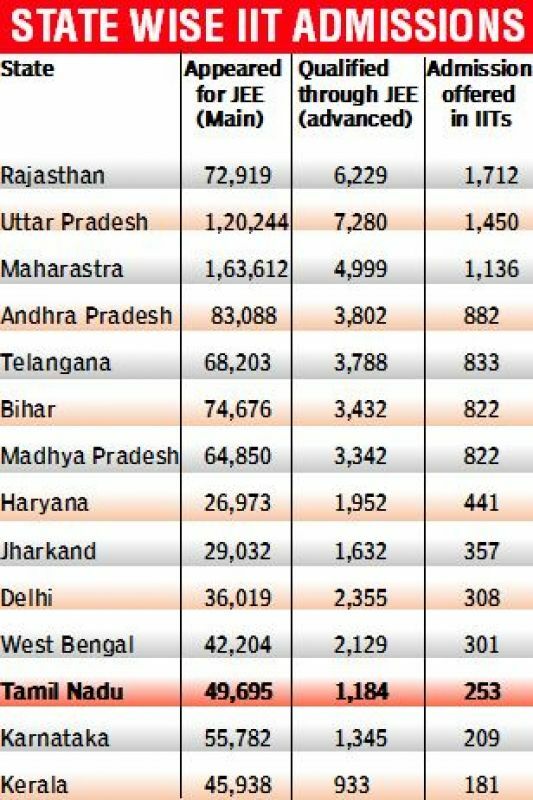 In these states, semi-urban and rural students appear more for competitive exams compared to Tamil Nadu where urban students are alone appearing for the exams. The coaching facilities are also not available to rural and semi-urban students,” he added. Career Consultant and educationist Jayaprakash A.Gandhi called for the change in the examination system to improve the record of state board students. “There should not be a blueprint or open choices in the exams. The exams should have the more objective type and application-oriented questions. They should make it difficult to score centum in exams,” he said.